Putting together a major event? Trying to drive more awareness? Let me walk you through the process we used to help increase website traffic from social media for an events company by 790%. This post will detail our history with the event space, outline our process for working with events companies to meet their marketing goals through the use of organic and paid social media strategies, and share some of the results we’ve had in the past. When we first started our company back in 2014, one of our main lead sources came from planning, promoting, hosting and running our own events. We began acquiring Meetup groups and used them as a way to meet new people in our community. Today, we manage a total of 12 local Meetup groups, with a total of over 15,000 members, and have gotten to know a large chunk of our community through these groups. We cannot deny that they have had a huge impact on our business. That being said, we realized in the very beginning (after doing several of our own larger-scale paid events), that marketing these events is a time-consuming process. Not only that, but most industries are pretty saturated when it comes to events. 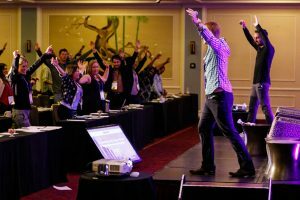 Breaking through the noise and drawing attention to your event requires a great deal of consistency and connectivity. Social media is hands down, the best amplification tool for marketing an event, as it has a lasting impact on immediate, short-term, and long-term results for an events company and a brand. In fact, companies in the events industry have some of the greatest success using social media to benefit their business. From our experience in running the Startup Socials San Diego Chapter, we developed a greater understanding of what it takes to tie branding, content and promotional tactics together in order to drive website traffic, get people engaged, and raise awareness for events through the use of specific, custom, social media strategies. Non-coincidentally enough, our first big event marketing client came into the picture when we partnered with the CEO of Startup Socials to help build and promote the Growth Marketing Conference, now a global series of large-scale, conference-style events. Since then, we have helped half a dozen or more events companies identify and excite their communities and provide branded experiences on social media. In our initial arrangement with Growth Marketing Conference, we were brought on to help with not only social media marketing but with content strategy and content marketing as well. The idea was that we would be in place to promote any upcoming events, and in the “off” season, we would contribute manpower to blog content management and the promotion side of the company. We were officially brought on about six weeks before the big event, so we knew we would have to hammer out the social media strategy as soon as possible. Typically, we recommend defining a promotional timeline at least two months in advance, and up to six months (or longer) in advance depending on the expected size of your audience. The first thing we do before touching any social channels is to create a strategy. This document outlines everything you need to know from a branding, audience and goals perspective, and then takes a deep dive into all of the tactics we intend to execute in order to represent the brand, serve the audience and meet those goals. For events, the overall marketing strategy is usually centered around a main goal of “X number of ticket sales for the entire event,” with social media goals being built around using social as a channel for sales support, audience engagement and raising awareness. Since it is difficult to track and attribute ticket sales directly to our efforts – most events companies use platforms and marketing software that are incapable of maintaining 100% end-to-end tracking – all parties involved must understand that there are other KPIs in play that support our role in sales. We define our key metrics and KPIs in the document and base our entire strategy around achieving those goals from a social media standpoint. And in order to achieve those goals, our strategy outlined exactly the tactics we would use on each of the channels we decided our main audience would be the most active on: Twitter and Facebook. For this client, all of our tactics relied on organic reach as we didn’t have an advertising budget at the time. But, for other events, we’ve had differing goals and budget, and therefore, differing plans. We knew with Growth Marketing Conference, there wasn’t going to be a lot of time for heavy account growth before the event. With some clients though, if we have the time and the budget, we recommend ramping up a social strategy that starts with heavy account growth and moderate activation that scales up months before the event. For instance, with one of the clients we are currently working with, SDInbound, we began planning for our second event many months in advance. While the full-scale strategy has not been launched yet, we have advised continued growing of the accounts in the meantime, and are maintaining a consistent level of activity on social media so that the audience is warmed up before we begin heavy promotions. Strategies like this require monthly account management so that there isn’t that dreaded “dead zone” after an event is over. With Growth Marketing Conference and many of the other events companies we work with, we continue management and growth of accounts even when there isn’t an event looming in the near future to reduce the inevitable loss of brand attention that happens once your event has concluded. However, some of our other clients only bring us in when an event is 1-2 months out, and that is okay also, but it means that a lot has to come together in a short period of time, and the full potential of a strategy is often not reached due to time (and / or budget) constraints. For our clients who come to us with an ad budget, we can use paid channels to even further amplify your message. A way to track sales that come in directly from Facebook ads (easier said than done sometimes, trust me). A budget for advertising. At least $500 is a good start. You’d be surprised how much you can get with a small budget. Having an existing list, audience, pixel, and/or following. Someone that already has heard of your brand. Starting from scratch? It’s quite a bit tougher. Having social proof, content, videos, and other things that show people what they are buying into and overcome their objections. An event response campaign. This is our secret weapon right now and it is working great. We create ads for the event, put the main value prop in the copy of those ads, and a delightful image, and we ask users to respond “interested” if they’d like more information. The message, even though it is canned, comes across as very appropriate and gets great responses, and more importantly, it drives ticket sales. After the initial strategy is created and approved, the next steps are to begin implementation. For the Growth Marketing Conference, we worked closely with the CEO to make sure that everyone on both teams were aligned, all approvals were given quickly, and we went to work as soon as possible to initiate the strategy. When we are in less of a time crunch (which usually isn’t the case), we can take more time elaborating on the audience message and brand, however, the best results come from companies who already have those elements figured out and are able to easily impart them to our team so we can get to work as soon as possible. In the event space, time is of the essence. Once we have the necessary information and assets, we can begin the setup phase. Most of our events clients rely heavily on Twitter for content distribution, but Facebook is more likely to generate ticket sales. At this point, our first steps will include creating a backlog of social content specifically for the event. Most of this content will be added into a content recycling tool or scheduled out natively on Facebook to be distributed until the day of the event. We will set up our event awareness auto-mentions for Twitter to target new followers in the specific location of the event, and if we have access to past attendee lists, we create and launch outreach campaigns on Twitter. This phase also includes researching our influencers (usually event speakers and other well-known industry folk), setting up our content posting schedules, and getting all of our internal tools and team aligned on the strategy. By this phase, we should ideally have a solidified speaker line-up. We should also have an idea of where we are with sponsors so we can begin promoting them as well. Once all of the tactics have been assigned out, we should have a pretty regular schedule of content being pushed out (depending on the blog / content strategy for the company hosting the event). We will be focusing on daily account growth and management, with the main goal of driving traffic as much as possible (depending on the goals of the strategy). With a larger number of solidified speakers, we can continuously create and distribute “speaker buzz” content meant to raise awareness for our speakers and hopefully get some reach from their audience and promotion as well. We’ll start aggressive account growth for Twitter if we haven’t already. Towards the end of this phase would be the ideal time to roll out a social contest (if that is part of the strategy), and Facebook ads should be up and running by now as well. Everything should be relatively finalized by now. We will shift our promotion strategy to be “last chance” focused. Our content and posting will be more aggressive / sales-oriented, and we will advise event coordinators, partners and volunteers to kick up the promotions from their personal accounts. Leadership team members should be focused on going to networking events in order to spread the word, and our contest should be coming to a close (if we are running one). During this phase we may launch an attendee engagement campaign where we tweet at members who have registered and ask them questions about what they are most excited for. We will also set up social promotions around agenda topics and event highlights during this time. A day or two before the event, we will shift focus to the live event promotions and set up a bunch of posts thanking sponsors and speakers. We’ll also turn off our automated actions the day before the event. If we plan a SnapChat Geofilter, we will set this up as well. An example of a takeaway post created and distributed live at Growth Marketing Conference East. We’ll monitor the hashtag and engage with anyone who uses it. We’ll ask questions to our most engaged audience to keep the buzz going, and we’ll be available to answer questions about the event from those on social who mention us. There will also be room for Instagram updates, Instagram Stories and/or Facebook Lives throughout the event if that is part of the strategy. Content curation with link retargeting – we create a custom short domain for each event that we work with, and we define a content curation strategy to engage our audience with the most relevant content, then we use link retargeting to pixel the people who click on our links in order to serve them Facebook event ads later. Daily account management – comment / message moderation, posting, and customer service. All events are different and the amount of data we have on hand can help us dictate where we think our efforts will land us, but we are not afraid to say that you cannot rely 100% on social media to sell your event tickets. 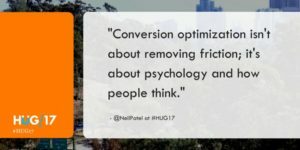 You also can’t rely 100% on your conversion data when measuring the effectiveness of a social media promotional campaign for an event. “No channel acts in isolation. When you first hear about an event, you typically don’t click on a button to buy your ticket. The process for buying involves a series of messages and/or interactions you receive related to the event that convinces you over time. You might hear about it on Facebook, read about it on the website, get an email and then ultimately decide to purchase a ticket. The path to purchase is multi-channel. This can make things complicated when trying to determine the ROI for each channel including social media. Multi-channel attribution is a challenge to achieve and most events use last click attribution for measurement. This means that the last channel the prospect came from before they converted gets 100% of the credit. This is why our strategies are tailored around audience growth, engagement, website (or landing page) traffic, and impressions. Those are the things we can measure, and we know that when an audience is consistently seeing the message and interacting with the brand on social media and having positive experiences when they do, there is a noticeable lift in sales through other channels like “direct” and email. These are not one-off solutions, the results of our efforts last long-term. With continued investment in social media and community engagement, we see even better results the next time around. Social media referral traffic – usually, when we become more active on social, these numbers rise as a result, even though they may not be directly linked to our efforts. We use UTM parameters, social media marketing software data, and on-platform analytics to track and measure these numbers. We also compile a report at the end of an event so that our clients can see how we did. 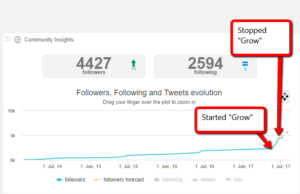 Twitter is by far the easiest and quickest channel to implement a growth strategy on. We can do it on other channels as well (Instagram and Facebook), but for Facebook growth, we need to have an advertising budget to fuel growth. 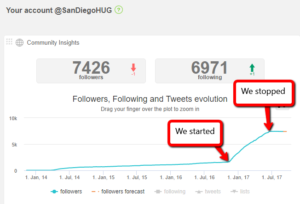 SDInbound’s Facebook Page analytics – provided with permission from San Diego Inbound Marketing. 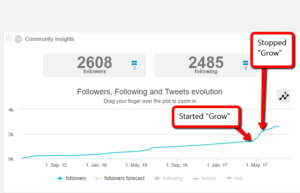 As for Twitter, we basically started with nothing and have been growing the account steadily (pretty much) ever since. And we’ve seen similar results for other accounts. Here’s an example of an organization who had two accounts and they wanted us to split our focus halfway through our allotted event marketing plan. The difference in growth is clearly defined. Also, it’s worth noting that we can see back in time on these accounts to years past, and each little uptick in the graph demonstrates the period before the event took place (June is when this annual event occurs). It is normal to see rapid increased growth right before an event, and then usually it dies off after. 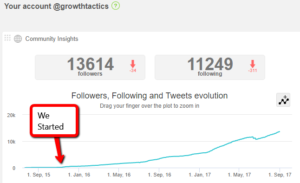 In the above example, we only worked on the account for June of 2017, and our results prove far better than anything that was done before we were brought on to manage and grow the accounts. Another extremely important metric we track is engagement. Then the third was the three months where we were actively promoting the upcoming event for June 2017 (April 2017 – June 2017). The time periods that contain months leading up to the event (period 1 and period 3) have the highest level of engagement. But, when we were managing the strategy, our results were far better than the previous attempt. This is directly in line with what we saw on the growth chart as well. The above example basically shows the difference between working with us or going it alone. This next example shows the difference between having a small audience versus continuing to grow an audience: the difference over time of what it looks like when you continue to be present and engage on social instead of only doing it right before an event. At the start of November 2016, we had roughly 4300, highly-targeted followers. The average number of engagements per day skyrocketed from one year to the next. But it wasn’t just followers and vanity metrics that went up. Our activity, our relationship with our audience, and our brand reputation also increased. The above data shows that we increased the number of click engagements by 325%! 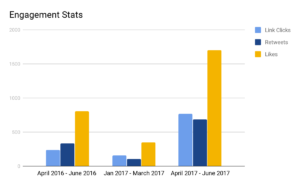 The other numbers are rates based on the number of Tweets sent, which was far greater in 2016, so less relevant, but the difference in the level of activity that we are able to achieve when we work with a client long-term is staggering. It is no surprise that the Growth Marketing Conference event in 2016 almost doubled in attendee size. We can’t claim 100% of the praise for that, the event has matured, and the brand has grown through the use of other very well-executed marketing strategies, but social media has played a role on the growth and prestige of the event. 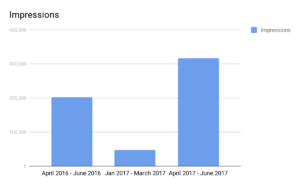 Unfortunately, we don’t have accurate tracking data for the year of 2015, which was our first year working with the company. 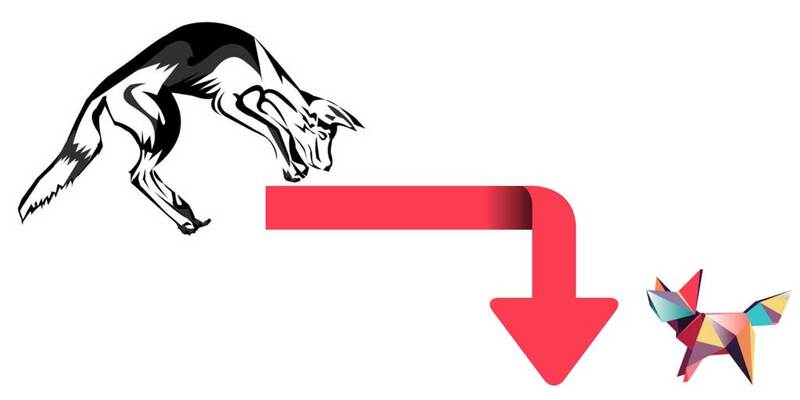 We were new at doing event marketing on social media and hadn’t started using UTM parameters to track our traffic. And, the Google Analytics data only goes back to July of 2015, so our count for total social sessions is incomplete. Also, I don’t have our final data for the annual Growth Marketing Conference 2017 event, typically happens in December. 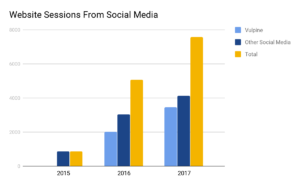 However, what we can show is that when we sample the only overlapping time period for each of the three years (July 1st – Sept 30th), we can see that there is a difference in traffic sessions driven from social media and our efforts, year over year. From July 1st, 2015 – September 30th, 2015, social media channels were responsible for driving a total of 852 sessions to the Growth Marketing Conference website. This was prior to our starting with the company, so essentially, this is what was happening without our team helping out. From July 1st, 2016 – September 30th, 2016, social media platforms drove a total of 3,055 sessions to the Growth Marketing Conference website. On top of that, Vulpine Interactive was responsible for driving an additional 2,016 sessions to the site, for a total of 5071 sessions driven from social channels (a 495% increase from the previous period where we weren’t managing the accounts). Now, you may be wondering about why we split the traffic into two categories here, and this is because when you become active on social media, other people tend to see and share your content more. We are now tracking our own direct efforts, and the amplification effect it has on other social traffic in general. To make it simple, Vulpine traffic is what we are sending directly, and Other Social Traffic is traffic sent to our site by other people from social media, usually from when they share our content from our website to their own social channels. Since we are generating more impressions and building brand awareness on social, we claim credit for influencing the number of people who are seeing and sharing our content on social platforms. From July 1st, 2017 – September 30th, 2017, social media platforms drove a total of 4,119 sessions. Vulpine drove an additional 3462, for a total of 7,581 sessions during the 2017 overlapping period (a 49% increase from the previous period, and a 790% increase over 2015). This graph visually demonstrates the numbers discussed above. Website traffic from social media is increasing the more we work on the channels. The more traffic we send to the site, the more attendee sign-ups we can potentially drive. When it comes to event promotion, social media is a game changer. And having a well thought out plan of action, realistic goals, and a way to measure your results is the crux of a great event marketing strategy. 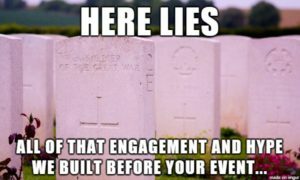 While it’s true that not all events are the same and that the problem of tracking direct ticket sales may discourage you from considering help from a marketing agency, based on the experience we’ve had, doing the bare minimum on social to promote an event is a waste of time. If you aren’t prepared to invest the time or money, don’t even bother with social. Your results may not be as good, but it’s better to wait until you can invest what is needed to hit a home run rather then redirect valuable resources away from the rest of your strategy if you can’t go all in on social media. Either way, we know that there is a lot of work that goes into pulling off a successful event, and social media is just one piece of the puzzle. Just know that whether you are trying to do all the work yourself, or you are looking to outsource some of the burden, you can always drop us a line. We are happy to take a deeper dive into the subject of promoting events on social media and will get you the answers or advice you are looking for any day of the week.